I'm not done writing up the entire Close-Combat phase yet, but here's the first 3 pages of what will probably be 6. Which describe who's in combat, defensive fire, consolidation moves, etc. Comment away! In WarStrike, Close-Combat is not a static affair. Where blobs of infantry meet, stand still, and then tediously hack at one another with swords and claws for turns on end. Instead, WarStrike takes a wider, more dynamic approach. 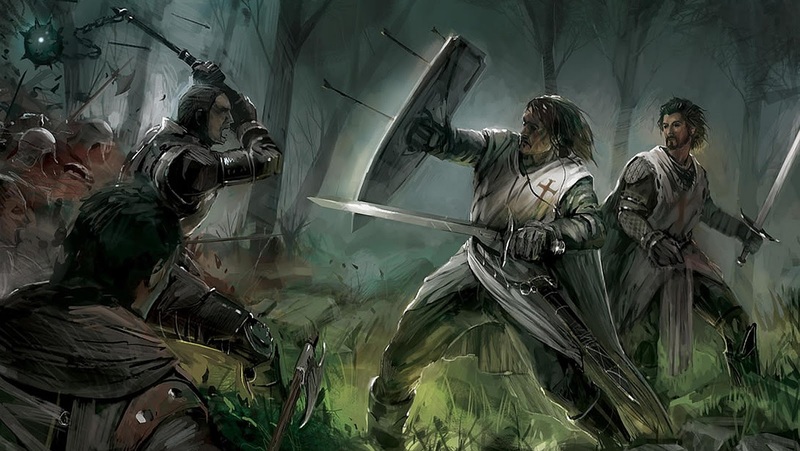 Rather than focus on melee alone, it’s Close-Combat actually encompasses both close-range shooting & maneuver, in addition to traditional melee attacks. The other big difference is that in WarStrike, Close-Combat is always played out to completion within the same turn in which that combat begins. Thus, when your troops meet in Close-Combat, one side will always win, and the other lose, before the next player turn begins. Taken in total, these differences mean that Close-Combat in WarStrike is always a bloody, decisive affair. Forming, quite often, the penultimate moment of the battle. Where victory or loss is finally decided between the players. A unit will be considered to be in Close-Combat if at least one of it’s models is within 6” of any enemy model. All units belonging to current player (the Attacker)are considered to be ‘Attacking Units’, while those of the opposing player (the Defender)will be considered to be ‘Defending Units’. Since Close-Combat only happens when enemy models get within 6” of each other, and resolves within the same turn, it can only be initiated by the current player as a result of their units’ movement during the previous Action Phase. The Defender’s unit’s aren’t going to just stand there and let an attacking unit charge into Close-Combat with them. If they can, they’ll attempt to shoot an attacking unit as it runs towards them! Other units in the defender’s Strike Force aren’t going to just stand still either. If they can, they’ll try and help their brothers in arms. However, if it has one or more markers, then it must roll a Ld check exactly as if it were attempting to perform an action in the Action Phase. If this Ld check is failed, then the unit will do nothing at all. They are too distracted or pinned down by the enemy to take any shots an at attacking unit. If the test is passed, then the unit may conduct Defensive Fire. Who a unit may shoot with their defensive fire depends on whether they’re in the combat, with an enemy unit running towards them; or out of the combat, where they have more freedom to pick their targets. Defending units in the Close-Combat may only fire at an attacking unit which is within 6” of their own unit. Defending units which are not in the Close-Combat may fire at any attacking unit which is within the current Aw range of their own unit leader. Any unit conducting Defensive fire, may only fire Snap Shots at an attacking unit. Suppression is a huge part of the Close-Combat Phase, just as it was in the Action Phase. However, WarStrike’s Close-Combat happens in such a compressed span of time compared to the Action Phase, that your troops will have little time to mentally recover from the effects of Suppression. Unless they see their enemy flee, their spirits will continue to fall until one side or the other breaks under the strain. Consolidation Moves are also exempt from the normal rules for Moving Around The Enemy, and are thus the only way of getting into base contact with enemy models for the purposes of melee attacks with fists, swords, and other such hand-to-hand weapons. BTW: The Reaction Phase is now gone again. I folded it's rules into the Close-Combat Phase. I've updated the last Turn Sequence post with the change.